Parsley Root is an age-old remedy for digestive disorders, kidney and liver problems, menstrual irregularities, and cleansing the blood and body of toxins. Filled with important vitamins, minerals and nutrients, and rich in chlorophyll. It contains more vitamin C than oranges and provides a good source of iron (important for the proper formation of red blood cells), potassium (good for lowering blood pressure), calcium and manganese (helpful for osteoporosis) and folic acid (which may help prevent cardiovascular disease). The chlorophyll content also makes it a wonderful breath freshener. If you are an allergy sufferer, it is good to note that the herbal extracts of Parsley root can inhibit the secretion of histamine, and, therefore, is useful in addressing hives and other allergic responses. As mentioned in the nutrition facts, Parsley Root is a very beneficial herb and contains histidine, which is an important amino acid that may inhibit tumors. Parsley root and the seeds are used for treating various gastrointestinal disorders, kidney disease, and liver disease. It has been found to be quite useful in treating ailments of the spleen and for passing kidney stones and gallstones. Parsley has been used since ancient times to improve both the digestion and assimilation of food and settles the stomach after a meal. It does this by increasing circulation to the digestive tract, and easing stomach problems, like indigestion and flatulence. An investigation into Parsley root tinctures is showing that there may be potential to protect the stomach against ulcers. Parsley root regulates blood sugar and is thought to be effective in cases of low blood sugar if there is an occasion of adrenal malfunction. It is a powerful herbal medicine for those who are suffering from diabetes. It has also shown to lower high blood pressure and may reduce the risk of various cardiovascular diseases. The strong diuretic action of the herb may help in the treatment of gout, rheumatism, and arthritis. 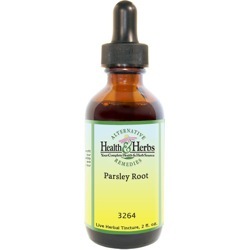 Parsley root tinctures are more commonly prescribed than the seed or leaves in herbal medicine. The root is often taken as a treatment for cystitis and rheumatic conditions. Parsley is used for easing bloating, reduce excess water weight and improve urination when it is painful. This action may aid in weight loss programs by eliminating water gain. When detoxing, studies have shown that Parsley root is a liver protective and its main components are myristicin, limonene, and These properties help to modulate blood sugar levels and are thought to be effective in cases of low blood sugar if there is occasion of adrenal malfunction. Parsley because of its diuretic properties, is believed to lower blood pressure, reduce the heart rate and relieve hypertension. The helpful herb contains nutrients that are known to be helpful in treating anemia as well as fatigue. This highly nutritious, Parsley Root works to normalize delayed menstruation, both helping to stimulating a delayed period and in relieving menstrual pain. It can give good results in the treatment of amenorrhoea and dysmenorrhoea. Parsley contains two substances, myristicin and apiol, which stimulates uterine contractions. In normal circumstances the herb is said to have a toning effect on the uterus, and is thought to similarly affect the prostate in men. Do not use this herb, however, if you are pregnant or trying to become pregnant as it has an abortifacient effect (induces menstruation and increases the chance of abortion) on the uterus. The herbal extract also help to improve hormonal balance in females and better estrogen secretion. This makes it useful in treating hormonal problems like premenstrual syndrome (PMS), menopause symptoms. Vitamin C has many different functions in the body, and is the body's primary water-soluble antioxidant,. This helps to renders dangerous free radicals, harmless. High levels of free radicals can contribute to cancer, diabetes, and asthma. This would explain why those who consume healthy amounts have reduced risks for all of these conditions. The volatile oils are believed to activate one of the liver's most important detoxifying enzymes, and may make Parsley root and leaf, a potential cancer-preventative functional food. A study on apigenin found that the flavone compound inhibits tumor metastasis in tissue cultures of human colon cancer. And apiganin also enhances the effects of some drugs used to treat colon cancer, according to a that was published in the February 2011 issue of the journal " Clinical and Experimental Metastasis." Research has found that Parsley may also help to reduce the risk of ovarian cancer by 20% in a large, population-based study. Parsley herb has also been used by herbalists to cure some ear infections, ringing in the ears and partial deafness. The extract of Parsley herb is a good remedy for hair loss, as well as for the dryness of the skin. Daily applications can help to improve hair growth, and make the skin more supple. Flourine is what is required to help prevent tooth decay, and as well as protecting the body from viruses, it, combined with the calcium content, helps to strengthen teeth and bones. Parsley Root is thought to make an excellent and nutritious tonic for body, for supporting alls the systems in the body. Ingredients: Parsley Root, Structured Water, 20% Alcohol. Non-Alcohol: Parsley Root, Structured Water, Vegetable Glycerin. Contraindications: Parsley is not recommended for pregnant women in large amounts, as it may cause uterine contractions, but used after delivery, it is said to tone the uterus. Parsley should also be avoided by those who suffer from kidney infection. If you use the herb frequently as a medicine, you should increase your intake of foods high in potassium, such as bananas and fresh vegetables, because diuretics deplete the body of potassium. Too much Parsley Root extracts can result in headaches, severe weight loss, nausea, dizziness and confusion. From Anonymous of Chilliwack, British Columbia on 2/7/2017 .